କଣିକା ପଦାର୍ଥ ବିଜ୍ଞାନ (ଇଂରାଜୀ: 'Particle physics'), ପଦାର୍ଥ ବିଜ୍ଞାନର ଏକ ଶାଖା ଅଟେ । ଏଥିରେ ବସ୍ତୁ (matter) ଓ ବିକିରଣ (radiation)କୁ ସଂଗଠିତ କରୁଥିବା କଣିକା ଗୁଡ଼ିକର ପ୍ରକୃତି ଉପରେ ଅଧ୍ୟୟନ କରାଯାଏ । In current understanding, particles are excitations of quantum fields and interact following their dynamics. Although the word "particle" can be used in reference to many objects (e.g. a proton, a gas particle, or even household dust), the term "particle physics" usually refers to the study of "smallest" particles and the fundamental fields that must be defined in order to explain the observed particles. These cannot be defined by a combination of other[clarification needed] fundamental fields. The current set of fundamental fields and their dynamics are summarized in a theory called the ଆଦର୍ଶ ମାନଦଣ୍ଡ, therefore particle physics is largely the study of the Standard Model's particle content and its possible extensions, with the recent finding of Higgs boson. Modern particle physics research is focused on subatomic particles, including atomic constituents such as electrons, protons, and neutrons (protons and neutrons are composite particles called baryons, made of quarks), produced by radioactive and scattering processes, such as photons, neutrinos, and muons, as well as a wide range of exotic particles. Dynamics of particles is also governed by quantum mechanics; they exhibit wave–particle duality, displaying particle-like behavior under certain experimental conditions and wave-like behavior in others. In more technical terms, they are described by quantum state vectors in a Hilbert space, which is also treated in quantum field theory. Following the convention of particle physicists, the term elementary particles is applied to those particles that are, according to current understanding, presumed to be indivisible and not composed of other particles. All particles, and their interactions observed to date, can be described almost entirely by a quantum field theory called the Standard Model. The Standard Model, as currently formulated, has 61 elementary particles. Those elementary particles can combine to form composite particles, accounting for the hundreds of other species of particles that have been discovered since the 1960s. The Standard Model has been found to agree with almost all the experimental tests conducted to date. However, most particle physicists believe that it is an incomplete description of nature, and that a more fundamental theory awaits discovery (See Theory of Everything). In recent years, measurements of neutrino mass have provided the first experimental deviations from the Standard Model[clarification needed]. ସମସ୍ତ ବସ୍ତୁ (matter) ଯେ କେତେକ ମୌଳିକ କଣିକାର (elementary particle) ସମାହାରରେ ଗଢା, ଏହି ଚିନ୍ତାଧାରା ଖ୍ରୀଷ୍ଟପୂର୍ବ ୬ଷ୍ଠ ଶତାବ୍ଦୀରୁ ରହିଅଛି । ୧୯ଶ ଶତାବ୍ଦୀରେ, ଜନ୍ ଡାଲ୍‌ଟନ୍, stoichiometry ସମ୍ପର୍କରେ ତାଙ୍କ ନିବନ୍ଧରେ, ଏହି ସିଦ୍ଧାନ୍ତରେ ଉପନୀତ ହୋଇଥିଲେ ଯେ ପ୍ରତ୍ୟକ ପ୍ରାକୃତିକ ପଦାର୍ଥ ଗୋଟିଏ ନିର୍ଦ୍ଧିଷ୍ଟ କଣିକାରେ ଗଢା । ପରମାଣୁର ଇଂରାଜୀ ଆଟୋମ୍(atom) ଶବ୍ଦଟି, ଗୀକ ଶବ୍ଦ ଆଟୋମୋସ୍ (atomos)ରୁ ଆସିଛି; ଏହାର ଅର୍ଥ "indivisible" ଓ ଏହା ସେତେବେଳେ ରାସାୟନିକ ମୌଳିକର କ୍ଷୁଦ୍ରତମ କଣିକାକୁ ବୁଝାଉଥିଲା । କିନ୍ତୁ ପଦାର୍ଥ ବିଜ୍ଞାନୀ ମାନେ ଜାଣିବାକୁ ପାଇଲେ ଯେ ଆଟୋମ୍ ବା ପରମାଣୁ ପଦାର୍ଥର କ୍ଷୁଦ୍ରତମ କଣିକା କି ମୌଳିକ କଣିକା ନୁହେଁ ବରଂ ଆହୁରି ଛୋଟ ଛୋଟ କଣିକା ଗୁଡ଼ିକର ସମାହାର, ଯଥା - ଇଲେକ୍‌ଟ୍ରୋନ୍ । ବିଂଶ ଶତାବ୍ଦୀର ପ୍ରାରମ୍ଭରେ ନ୍ୟୁକ୍ଲିଆର ଫିଜିକ୍ସ ଓ କ୍ୱାଣ୍ଟମ ଫିଜିକ୍ସ ବିଷୟରେ ମିଳିଥିବା ତଥ୍ୟ ସବୁକୁ ୧୯୩୯ରେ ଲିସ୍ ମିଟ୍‌ନର୍, ନ୍ୟୁକ୍ଲିଆର ଫିଜନ୍‌ର ପ୍ରମାଣ ସ୍ୱରୂପ (based on experiments by Otto Hahn), ଏବଂ ହାନ୍‌ସ ବିଥ୍‌, ନ୍ୟୁକ୍ଲିଆର ଫ୍ୟୁଜନ୍‌ର ପ୍ରମାଣ ସ୍ୱରୂପ ଉପସ୍ଥାପନ କରିଥିଲେ; ଉଭୟ ଆବିଷ୍କାର ପରମାଣୁ ଅସ୍ତ୍ରର ଗଠନ ପାଇଁ ବାଟ କଢେଇ ନେଇଥିଲା । Throughout the 1950s and 1960s, a bewildering variety of particles were found in scattering experiments. It was referred to as the "particle zoo". That term was deprecated after the formulation of the Standard Model during the 1970s in which the large number of particles was explained as combinations of a (relatively) small number of fundamental particles. The current state of the classification of all elementary particles is explained by the Standard Model. It describes the strong, weak, and electromagnetic fundamental interactions, using mediating gauge bosons. 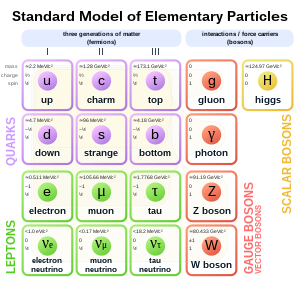 The species of gauge bosons are the gluons, Error no symbol defined, Error no symbol defined and Error no symbol defined bosons, and the photons. The Standard Model also contains 24 fundamental particles, (12 particles and their associated anti-particles), which are the constituents of all matter. Finally, the Standard Model also predicted the existence of a type of boson known as the Higgs boson. Early in the morning on 4 July 2012, physicists with the Large Hadron Collider at CERN announced they have found a new particle that behaves similarly to what is expected from the Higgs boson. Budker Institute of Nuclear Physics (Novosibirsk, Russia). Its main projects are now the electron-positron colliders VEPP-2000, operated since 2006, and VEPP-4, started experiments in 1994. Earlier facilities include the first electron-electron beam-beam collider VEP-1, which conducted experiments from 1964 to 1968; the electron-positron colliders VEPP-2, operated from 1965 to 1974; and, its successor VEPP-2M, performed experiments from 1974 to 2000. CERN, (Franco-Swiss border, near Geneva). Its main project is now the Large Hadron Collider (LHC), which had its first beam circulation on 10 September 2008, and is now the world's most energetic collider of protons. It also became the most energetic collider of heavy ions after it began colliding lead ions. Earlier facilities include the Large Electron–Positron Collider (LEP), which was stopped on 2 November 2000 and then dismantled to give way for LHC; and the Super Proton Synchrotron, which is being reused as a pre-accelerator for the LHC. DESY (Hamburg, Germany). Its main facility is the Hadron Elektron Ring Anlage (HERA), which collides electrons and positrons with protons. Fermilab, (Batavia, United States). Its main facility until 2011 was the Tevatron, which collided protons and antiprotons and was the highest-energy particle collider on earth until the Large Hadron Collider surpassed it on 29 November 2009. KEK, (Tsukuba, Japan). It is the home of a number of experiments such as the K2K experiment, a neutrino oscillation experiment and Belle, an experiment measuring the CP violation of B mesons. Many other particle accelerators do exist. The techniques required to do modern, experimental, particle physics are quite varied and complex, constituting a sub-specialty nearly completely distinct from the theoretical side of the field. ଛାଞ୍ଚ:Quantum field theory Theoretical particle physics attempts to develop the models, theoretical framework, and mathematical tools to understand current experiments and make predictions for future experiments. See also theoretical physics. There are several major interrelated efforts being made in theoretical particle physics today. One important branch attempts to better understand the Standard Model and its tests. By extracting the parameters of the Standard Model, from experiments with less uncertainty, this work probes the limits of the Standard Model and therefore expands our understanding of nature's building blocks. Those efforts are made challenging by the difficulty of calculating quantities in quantum chromodynamics. Some theorists working in this area refer to themselves as phenomenologists and they may use the tools of quantum field theory and effective field theory. Others make use of lattice field theory and call themselves lattice theorists. Another major effort is in model building where model builders develop ideas for what physics may lie beyond the Standard Model (at higher energies or smaller distances). This work is often motivated by the hierarchy problem and is constrained by existing experimental data. It may involve work on supersymmetry, alternatives to the Higgs mechanism, extra spatial dimensions (such as the Randall-Sundrum models), Preon theory, combinations of these, or other ideas. A third major effort in theoretical particle physics is string theory. String theorists attempt to construct a unified description of quantum mechanics and general relativity by building a theory based on small strings, and branes rather than particles. If the theory is successful, it may be considered a "Theory of Everything". There are also other areas of work in theoretical particle physics ranging from particle cosmology to loop quantum gravity. This division of efforts in particle physics is reflected in the names of categories on the arXiv, a preprint archive: hep-th (theory), hep-ph (phenomenology), hep-ex (experiments), hep-lat (lattice gauge theory). In principle, all physics (and practical applications developed therefrom) can be derived from the study of fundamental particles. In practice, even if "particle physics" is taken to mean only "high-energy atom smashers", many technologies have been developed during these pioneering investigations that later find wide uses in society. Cyclotrons are used to produce medical isotopes for research and treatment (for example, isotopes used in PET imaging), or used directly for certain cancer treatments. The development of Superconductors has been pushed forward by their use in particle physics. The World Wide Web and touchscreen technology were initially developed at CERN. Additional applications are found in medicine, national security, industry, computing, science, and workforce development, illustrating a long and growing list of beneficial practical applications with contributions from particle physics. The primary goal, which is pursued in several distinct ways, is to find and understand what physics may lie beyond the standard model. There are several powerful experimental reasons to expect new physics, including dark matter and neutrino mass. There are also theoretical hints that this new physics should be found at accessible energy scales. Furthermore, there may be surprises that will give us opportunities to learn about nature. Much of the effort to find this new physics are focused on new collider experiments. The Large Hadron Collider (LHC) was completed in 2008 to help continue the search for the Higgs boson, supersymmetric particles, and other new physics. An intermediate goal is the construction of the International Linear Collider (ILC), which will complement the LHC by allowing more precise measurements of the properties of newly found particles. In August 2004, a decision for the technology of the ILC was taken but the site has still to be agreed upon. In addition, there are important non-collider experiments that also attempt to find and understand physics beyond the Standard Model. One important non-collider effort is the determination of the neutrino masses, since these masses may arise from neutrinos mixing with very heavy particles. In addition, cosmological observations provide many useful constraints on the dark matter, although it may be impossible to determine the exact nature of the dark matter without the colliders. Finally, lower bounds on the very long lifetime of the proton put constraints on Grand Unified Theories at energy scales much higher than collider experiments will be able to probe any time soon. In May 2014, the Particle Physics Project Prioritization Panel released its report on particle physics funding priorities for the United States over the next decade. This report emphasized continued U.S. participation in the LHC and ILC, and expansion of the Long Baseline Neutrino Experiment, among other recommendations. ↑ ୩.୦ ୩.୧ Braibant, S.; Giacomelli, G.; Spurio, M. (2009). Particles and Fundamental Interactions: An Introduction to Particle Physics. Springer. pp. 313–314. ISBN 978-94-007-2463-1. ↑ ୪.୦ ୪.୧ "Particle Physics and Astrophysics Research". The Henryk Niewodniczanski Institute of Nuclear Physics. Retrieved 31 May 2012. ↑ "Fundamentals of Physics and Nuclear Physics" (PDF). Retrieved 21 July 2012. ↑ "Scientific Explorer: Quasiparticles". Sciexplorer.blogspot.com. 22 May 2012. Retrieved 21 July 2012. ↑ Nakamura, K (1 July 2010). "Review of Particle Physics". Journal of Physics G: Nuclear and Particle Physics. 37 (7A): 075021. Bibcode:2010JPhG...37g5021N. doi:10.1088/0954-3899/37/7A/075021. ↑ Mann, Adam (28 March 2013). "Newly Discovered Particle Appears to Be Long-Awaited Higgs Boson - Wired Science". Wired.com. Retrieved 6 February 2014. ↑ "Brookhaven National Laboratory – A Passion for Discovery". Bnl.gov. Retrieved 23 June 2012. ↑ "index". Vepp2k.inp.nsk.su. Retrieved 21 July 2012. ↑ "The VEPP-4 accelerating-storage complex". V4.inp.nsk.su. Retrieved 21 July 2012. ↑ "VEPP-2M collider complex" (in ରୁଷିୟ). Inp.nsk.su. Retrieved 21 July 2012. ↑ "The Budker Institute Of Nuclear Physics". English Russia. 21 January 2012. Retrieved 23 June 2012. ↑ "Welcome to". Info.cern.ch. Retrieved 23 June 2012. ↑ "Germany's largest accelerator centre – Deutsches Elektronen-Synchrotron DESY". Desy.de. Retrieved 23 June 2012. ↑ "Fermilab | Home". Fnal.gov. Retrieved 23 June 2012. ↑ "Kek | High Energy Accelerator Research Organization". Legacy.kek.jp. Retrieved 23 June 2012. ↑ "Fermilab | Science at Fermilab | Benefits to Society". Fnal.gov. Retrieved 23 June 2012. Close, Frank (2004). Particle Physics: A Very Short Introduction. Oxford University Press. ISBN 0-19-280434-0. Close, Frank; Marten, Michael; Sutton, Christine (2004). The Particle Odyssey: A Journey to the Heart of the Matter. Oxford University Press. ISBN 9780198609438. Ford, Kenneth W. (2005). The Quantum World. Harvard University Press. Oerter, Robert (2006). The Theory of Almost Everything: The Standard Model, the Unsung Triumph of Modern Physics. Plume. Schumm, Bruce A. (2004). Deep Down Things: The Breathtaking Beauty of Particle Physics. Johns Hopkins University Press. ISBN 0-8018-7971-X. Close, Frank (2006). The New Cosmic Onion. Taylor & Francis. ISBN 1-58488-798-2. Robinson, Matthew B.; Bland, Karen R.; Cleaver, Gerald. B.; Dittmann, Jay R. (2008). "A Simple Introduction to Particle Physics". arXiv:0810.3328 [hep-th]. Robinson, Matthew B.; Cleaver, Gerald; Cleaver, Gerald B. (2009). "A Simple Introduction to Particle Physics Part II". arXiv:0908.1395 [hep-th]. Griffiths, David J. (1987). Introduction to Elementary Particles. Wiley, John & Sons, Inc. ISBN 0-471-60386-4. Kane, Gordon L. (1987). Modern Elementary Particle Physics. Perseus Books. ISBN 0-201-11749-5. Perkins, Donald H. (1999). Introduction to High Energy Physics. Cambridge University Press. ISBN 0-521-62196-8. Povh, Bogdan (1995). Particles and Nuclei: An Introduction to the Physical Concepts. Springer-Verlag. ISBN 0-387-59439-6. Boyarkin, Oleg (2011). Advanced Particle Physics Two-Volume Set. CRC Press. ISBN 978-1-4398-0412-4. Nobes, Matthew (2002) "Introduction to the Standard Model of Particle Physics" on Kuro5hin: Part 1, Part 2, Part 3a, Part 3b.